Important Note: The optional CD includes the entire book plus supplemental resources. Ages 12 through adult. 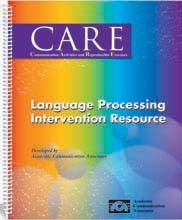 This book includes language processing exercises and reproducible worksheet pages to help older students and adults who have difficulty processing and using language. The activities challenge students to recall information and to think about what they hear in sentences and paragraphs. The worksheet activities require students to focus on the meaning of sentences and to use contextual information. Listening passages in CARE focus on topics such as recycling, protecting animals, and interacting with people who have disabilities. Skills emphasized include using contextual information, identifying words with similar meanings, rephrasing sentences, combining details to create sentences, defining words, explaining idioms, recalling steps in a process, recalling details from auditory messages, and making inferences. The lessons and reproducible worksheets in this book can be used to build critical language processing skills and to strengthen word retrieval. The activities can be modified easily to meet the specific learning needs of students. An optional CD is available with all of the worksheets from the book plus supplemental worksheet activities. The CD is highly recommended. The updated CD includes the entire book PLUS supplemental activity pages.. The pages on the CD are in a PDF format, making it easy to reproduce pages. A downloadable edition of this product is available. See "related product" link below.